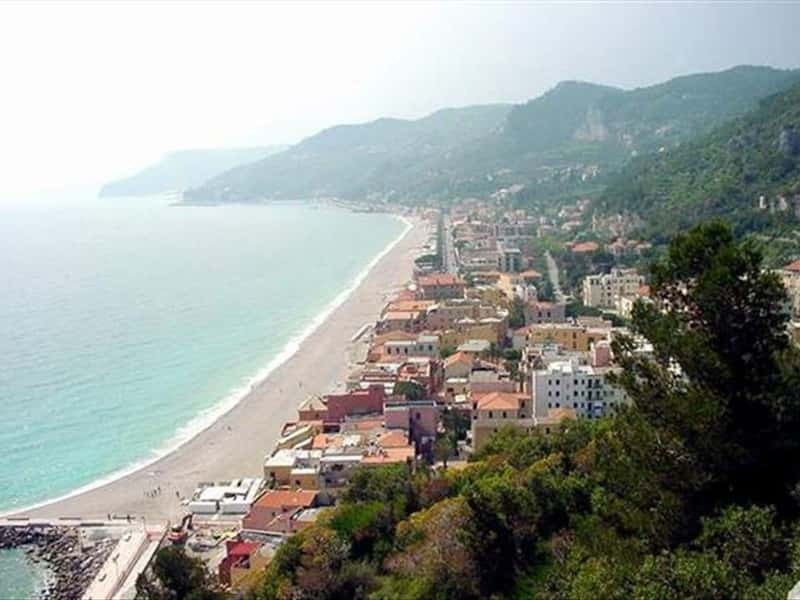 Finale Ligure is an industrial town and also a popular tourist resort center in the province of Savona, located between Capo Noli towards East and the promontory of Caprazoppa towards West. The city is located in an area rich in prehistoric artifacts: the tomb of the "Giovane Principe" (Young Prince), for example, which dates back 25,000 years and is considered one of the most attractive and interesting traces of the Paleolithic period. Various exhibits and fossils of the Upper Paleolithic and Middle Paleolithic period have been found here, such as the cemetery discovered near Arene Candide. These traces, found in the numerous caves, help the studious rebuild the local life style in the different prehistoric eras: the rock incisions, the mild climate and the presence of high cliffs and a blue sea, make of Finale Ligure, one of the pearls the Riviera. The town preserves traces of: the pre-Roman times (the village of the souls), the Roman times with the via Romana (road built by Romero and Julia Augusta with its five bridges of Val Ponci), early Christian (the Parish and a baptismal church of the IV century) and Byzantine (Castrum Pertice , Castra Pia and Orco). Finale Ligure was a fief in the Middle Ages and then a Marquisate ruled by the Del Carretto Family. The town battled with Genoa in the years 1447-1449 during the famous War for the conquest of Finale. After a period of great prosperity in the history of the Marquisate, it struggled during the war between France and Germany and submitted a stage of decline in the mid-XVI century. Ceded to Spain in the XVI century, the town became, for a century, a strategic point for control of Northern Europe. Taken over by the Austrian government, in 1713 Finale was offered to the Republic of Genoa, which caused conflicts and riots that brought to the definitive end of the prosperity and development lived under Spanish rule. In 1740 the town was involved in the events concerning the War of Austrian Succession and with the Peace of Aachen, it was finally subjected to the Republic of Genoa. With the arrival of the French, Finale followed the events of the Ligurian Republic. the XVI century palace Buraggi, the palaces Grossi and De Ferrari. This town web page has been visited 32,639 times.